Summer might be coming to an end, but I’m still loving 2 of my favorite hydrators: cold-brew tea and infused water. And the more I learn about the benefits of tea, the more I want to drink it. 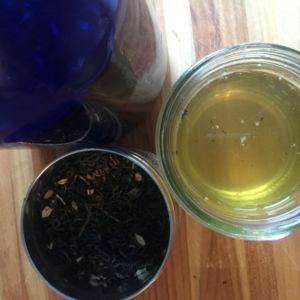 If you’re looking for a great drink this summer, give cold-brewed tea a try. It’s got a non-bitter, delicate taste, is easy to make, and offers benefits far beyond most hydrators. Here’s the how and the why of cold-brewed iced tea. 64 oz. water (cold or room temp). Place tea, water, and optional add-in ingredients in a the container. Optionally, muddle/mash in add-ons to release flavor. Allow to steep at room temp 45-60 minutes, or in refrigerator 2-4 hours. Strain out tea leaves and add-ons. Refrigerate or serve over ice. If you like Jasmine Green Tea, here’s one of my favorites. Or, if possible, check out any organic loose leaf teas at your local health food store or co-op. Green Jasmine. Antioxidants repair and protect cells, and EGCG goes for the brain. In fact, in mice induced with Alzheimer’s and Parkinson’s Disease, it helped to protect brain cells from dying, as well as ‘rescuing’ already damaged neurons in the brain, a phenomenon called neurorescue or neurorestoration. Studies are now underway in China on human Parkinson’s Disease patients. Sounds smart to me. And the most recent buzz about going green? Metabolism and fat loss. Our friend, EGCG, helps our bodies oxidize and burn fat. Multiple studies have shown an increase in metabolic rates, weight loss, decreased waistline and fat loss with consistent green tea ingestion. Initially, it was attributed to the caffeine. But recent studies have shown these effects in caffeinated and decaffeinated green tea (there’s actually little caffeine in green tea to begin with). The studies have used both green tea “extract” as a concentrated form of antioxidants and regular, brewed green tea. Let’s drink to that! I’ll be the first to tell you that many, many factors go into overall health and fat loss. But, you need hydration anyway – most athletes need 48-80 ounces per day + 20-32 ounces per hour training to stay out of a chronic dehydration mode. Dehydration has a DIRECT effect on your performance, more than lack of electrolytes or lack of carbs. If you go for a ride and feel like you’re draggin’, look to your hydration status first. Of course, water’s a great choice for daily hydration. But, if you want a little more benefit per gulp, brew green tea leaves in your water. And, don’t worry about any negative effect the 5-30mg of caffeine per cup of green tea might have on your hydration status – studies have shown that caffeinated drinks hydrate us well. Get big-time cellular detoxifying benefits that protect cells from free radicals, the damage that can lead to blood clot formation, atherosclerosis, and cancer. Both green and black tea block DNA damage associated with tobacco and other toxic chemicals in studies. Consume 10 times the polyphenols (antioxidants) found in most fruits or vegetables. You’re not off the hook for eating fruits & vegetables, though, so don’t chuck your salad just yet. While tea is a very concentrated source of antioxidants, it contains different ones than fruits and vegetables. And just like a Thanksgiving Dinner, the more the merrier, so drink tea AND eat your fruits and vegetables. Lower your risk of heart disease, certain cancers, high blood pressure, and obesity. This is confirmed in both human population studies and lab studies with rats. People groups that drink the most tea certainly have lesser amounts of these diseases, and tea-drinking rats have less as well. Potentially lower your risk for allergic reactions, bone loss, diabetes, and Parkinson’s disease. Recover better. Although carbs, proteins, and fluids are the primary recovery nutrients, don’t discount the importance of antioxidants. They fight the free radicals that build up during training and damage your cells, and improve health from the cell on up. A 16 oz. recovery serving of our Chai Latte will give you fluid, protein, carbs, and these powerful antioxidants. 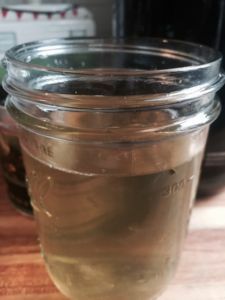 It’s easy as can be, and it allows you to brew tea without risk of the bitter taste you can get if you use too hot of water, or allow it to brew too long It’s also great for summer! In regards to nutrients and antioxidants, different studies have shown that the levels have been similar to hot-brewed tea, and with delicate teas like white leaves, the nutrient retention is improved. What’s more, it’s far better to brew your own tea than to buy ready-to-drink ones. 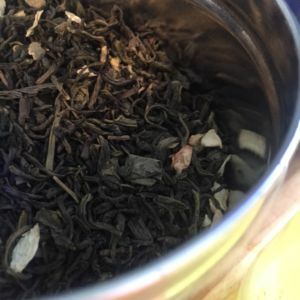 The tea’s precious nutrients are lost with storage (once made), so that bottle setting in the store likely offers far less than your own brew. Another option? Just chop up some cucumbers & lemon, place in the bottom of a jar or pitcher, pour in cold water, and you’ll have a delicious refreshing flavored water to drink. Not many great recipes are quite this easy. Just a few ingredients and several options, and you’re on your way to delicious, nourishing refreshing drinks. It just may help you stay a fit, brainy, calm, cardiovascularly strong cyclist with improved eye health and good oral hygiene. And, no need for artificial sweeteners or sugar. Let’s see Red Bull do that. If you’d like to work with Kelli one-on-one with a Custom Nutrition Plan & Coaching, or download one of her acclaimed Instant Download Plans like Fuel Right Race Light, click here: Apex Nutrition Plans for Endurance Athletes. Be sure to use coupon code lovingthebike for a 15% discount!